As we all know the Sigma 35mm F1.4 DG HSM A lens is the best wide-angle prime lens for Nikon D600/ D610. Zeiss Distagon T 35mm f/1.4 ZF2 and Samyang 35mm F1.4 AS UMC are both great lenses, while the Samyang lens is much cheaper. The new released Sigma 24mm / 20mm F1.4 DG HSM | Art lens, Nikon AF-S NIKKOR 24mm f/1.8G ED are another best choice. 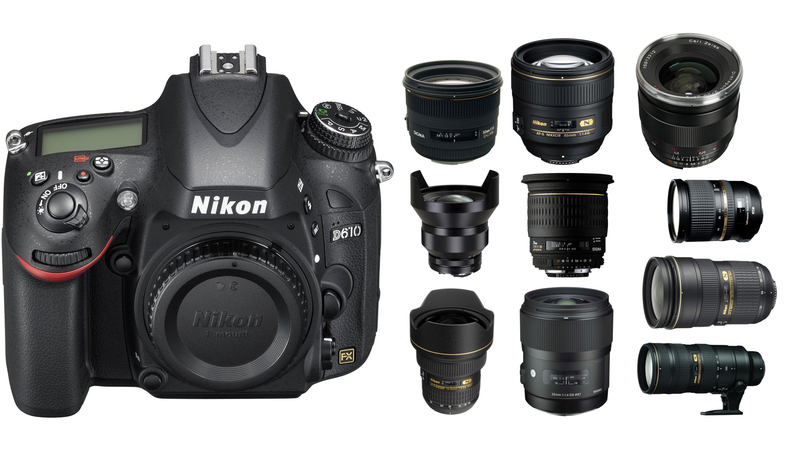 From the list, it is clear the best wide-angle zoom lens for Nikon D600/D610 is Nikon AF-S NIKKOR 14-24mm f/2.8G ED lens. You also can try the Tokina AT-X 16-28 F2.8 PRO FX Nikon lens at a low price. The new announced Sigma 24-35mm f/2 DG HSM Art Lens is another best choice. In this range, Carl Zeiss Distagon T* Otus 1.4/55 ZF.2 is the best standard lens for Nikon D600/D610. If you are looking for a cheap standard lens, You also can choose Sigma 50mm F1.4 EX DG HSM, Nikon AF Nikkor 50mm f/1.4D,Nikon AF-S Nikkor 50mm f/1.4G or Nikon AF-S NIKKOR 50mm f/1.8G lens. From the below, you can see the Tamron SP 24-70mm F2.8 Di Vc lens is the best standard zoom lenses for Nikon D610. The new released Nikon AF-S NIKKOR 24-70mm f/2.8E ED VR Lens is now in stock and shipping for more than $2,000. Carl Zeiss Lenses are very great lenses for Nikon D600/D610, but the price is very expensive. So you can try Nikon AF-S NIKKOR 85mm f/1.8G, Samyang 85mm f/1.4 Aspherique IF Nikon and Sigma 85mm F1.4 EX DG HSM lens for your Nikon D610 at an affordable price. From the below, you can see most super telephoto lenses for nikon D610/D600 are very expensive. You can try Sigma 150mm F2.8 EX DG OS HSM APO Macro lens. The new released Nikon AF-S 300mm f/4E PF ED VR Lens and the Nikon AF-S NIKKOR 200-500mm f/5.6E ED VR Lens are your another best choice.